Catherine"Katie" (Younkin) Firestone born in 1813 in Hexebarger near Kingwood, Somerset County, PA, the daughter of Jacob "of John" and Eleanor (Chambers) Younkin. 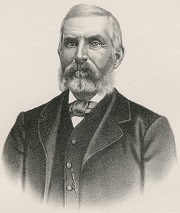 Katie married George Firestone (1812-1884), son of John and Eva Catherine (Thrasher) Firestone of Lower Turkeyfoot Township who was a native of Virginia. He could neither read nor write. 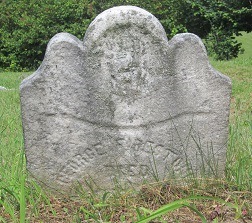 George's parents were natives of Virginia and had been pioneer settlers of Ursina, Somerset County circa 1802. John's father Johann Joseph Firestone, a German immigrant from Alsace, was a veteran of the American Revolution, and grandparents Hans Nicholas and Catharina (Nunnemacher) Firestone brought the family to America aboard the Peggy, arriving in Philadelphia on Sept. 24, 1753. George's known siblings were Catherine Younkin, Joseph Firestone, Jacob Firestone, John Firestone, Mary May, Elizabeth Miller and Margaret Leighliter. Prior to marriage, George had produced a son out of wedlock with Hannah Ansell, daughter of Michael Ansell (and who later in life married John Minerd). The son was named Michael Ansell and raised by Hannah under that name until the time that he entered the Union Army during the Civil War, when the surname "Firestone" was added so that his entire name was "Michael Ansell Firestone." As illegitimacy was a dark stain on families of the 19th century, it was conveniently disguised over the years by the Firestones that Catherine -- and not Hannah -- was Michael's birth mother. Katie and George produced these five known children of their own -- Ellen "Nellie" Nicola, Simon Firestone, Harriet Burkholder, Jacob "Ross" Firestone and Norman Firestone. When Katie's father Jacob Younkin died in 1848, he did so without the benefit of having written a will. Katie and her brother John M. Younkin each inherited the sum of $21.44 from the estate. At some point presumably in about 1851, George borrowed $700 from his father and signed promissory notes about repayment of $50 a year. When the father was dying, he wrote a last will and testament on May 1, 1852, stating that George would need to make the payments to the heirs. The loan may have been used to buy a farm which consisted of 320 acres and upon which they resided for the balance of their lives. The farm was in the Cranberry Glade section of Lower Turkeyfoot Township, Somerset County, at the border of Fayette County and next to the farm of Leonard and Martha (Minerd) Harbaugh Sr.
Circa 1850, federal census records show the Firestones making their home in Lower Turkeyfoot Township, with George's 81-year-old father John Firestone and 17-year-old orphaned nephew William Younkin living on the property. While they remained on the farm for decades, their post office changed, from Draketown to Harnedsville to Ursina. The family struggled to meet their obligations on the farm, which George once called "hard toil and short crops." The Firestones worried during the Civil War when unmarried teenage son Simon joined the U.S. Army as a member of the 85th Pennsylvania Volunteer Infantry. While away, the dutiful son regularly sent home his pay so that his parents could pay their debts. George once said that "I drew a bounty after he reenlisted perhaps $200 which I got from the Agent. Simon sent me money perhaps three months after he went to the army. The first was $20 and every month or two afterwards he sent $15 - $20 - $30 - & once $100 -- of his wages for to use for our Support.... We have all the time lived on our poor mountain farm we could not raise wheat on it. But buckwheat & oats & potatoes although every year we were compelled to purchase flour for the support of the Family." As Simon's terms of enlistment expired, he rejoined the army and received bounties (or bonuses) which he also sent home. Anxiety turned into grief when Catherine and George learned that their son had died of disease on Nov. 8, 1865, in Danville, VA, some six months after the war's end. George suffered from epilepsy, which severely limited the amount of farm work he could perform. He told others that he had seizures about twice a week, and once lost an entire day due to incapacitation. A friend once referred to him as "very feeble." On April 2, 1879, the 66-year-old Catherine traveled to Somerset with son Ross and son-in-law James Wesley Burkholder, and with help from the clerk of the Court of Common Pleas, filled out paperwork asking that the federal government award her a mother's pension as compensation for her Simon's wartime death. [Mother Application #244.553] In her filing, she claimed that she and her husband had relied upon Simon for labor and financial support. Because she could not read or write, she asked that all correspondence be sent to her family physician, Dr. W.S. Harah of Ursina. In response, the Pension Office requested to know if Simon had ever married, how his parents had been supported since his death, the type and value of family property and specifics about how he had provided them with money. The Pension Office also asked for evidence from the Firestones' physician to prove that George was physically unable to work. One can imagine the frustration the unlettered Firestones felt at having to furnish such facts in writing. Son Norman and sons-in-law Freeman Nicola and James Wesley Burkholder testified in writing to the Pension Office that the Firestones typically had two to three cows on the farm, two horses "of a cheap quality" and hogs and sheep which were fed acorns and chestnuts. "When butchered if not so fat yet they eat them," the men wrote. "The farm would raise buckwheat, oats & potatoes, wheat & corn would not make a crop so they had all ways to purchase their bread material, wheat flour." Circa 1879, George was involved in a transaction of land involving John Rayman Jennings Sr. and Michael Koontz located in Lower Turkeyfoot and containing three acres, a one-and-a-half story dwelling, stable and blacksmith shop. In May 1880, the Firestones' farm nearly was engulfed in a blaze. Reported the Somerset Herald, "A destructive fire passed over the greater part of George Firestone's farm in the mountains of Turkeyfoot. Being surrounded by woods it played havoc with the fence, and would have burned the buildings, had not the neighbors come to aid him in fighting the fire." Catherine died on April 1, 1883 at the age of 70. Her remains were placed into rest in the Delilah Younkin Cemetery, sometimes also known as the Ansell Cemetery. [Find-a-Grave] George paid to have a marker erected at the grave. When he wrote his will on July 7, 1886, as he was dying, he ordered "my executor to have me decenty [sic] buried by the side of my wife Catharean and to have a tomb stones like the ones I got for my wife Cathren and to be paid for out of my estate." Despite her efforts, her pension request was never granted, and the matter was dropped. In about 1885, a firm from Mauch Chunk, PA was engaged in logging operations in the region and possibly also stone quarrying, known as the Schweibinz Heinen Company, with office in Confluence. The owners also established the Somerset County Railroad Company, ostensibly for use in transporting lumber and stone over an 8.7-mile length of track to the Baltimore and Ohio Railroad lines. George apparently allowed the company to remove timber from his property for a price of $240.08. The bill was not paid until after his death. An auction was held to dispose of George's personal property and took place on Dec. 4, 1886. At the sale, daughter in law Mary Ellen (Gates) Firestone purchased a feather tick bed, quilt, towel and rocking chair. Daughter in law Jane "Jennie" (Hartzell) Firestone bought a pillow slip and bolster, sheet and pillow. Daughter Harriet Burkholder was the high bidder for a blanket. Son in law James Wesley Burkholder acquired a sheet, tick mattress, coverlid, towel, table clock, lots of carpet, a looking glass (mirror) and two chairs. Son Ross purchased a coverlid, stand, pocket knife, bridle and grey mare. Daughter Ellen Nicola bought a bureau, and her husband Freeman Nicola a blanket and bedstead. Double cousin James "Dempsey" Younkin was the highest bidder for a shawl and cloth. Among other buyers, neighbor Ed Lingenfield acquired two calves and a cow. In October 1935, more than half a century after Catherine's and George's deaths, their gravesites were visited by a distant double cousin Charles Arthur "Charleroi Charley" Younkin, an organizer of the Younkin National Home-coming Reunion. Charley was in the midst of deep research, trying to make sense of all the disparate branches of the ancient family in Somerset County and across the nation. In a letter to reunion president Otto Roosevelt "Pete" Younkin, Charley wrote: "Visited the Lila Younkin Cem. and found the graves of Katie (Younkin) Firestone and her Husband George Firestone. I am told by Aunt Rosetta Miner [that Katie] was a cousin to Polly (Younkin) Miner.... The cemetery at Lila Younkin farm is all cleaned up in very good shape thanks to our good friend Wm. L. Younkin" [of the family of Frederick J. Younkin]. Research for this page graciously shared by Denny Shirer, the late Olive Duff, the late Donna (Younkin) Logan and the late Joseph Warren Thomas III.